Mixing too many concepts into a game and making them work, doesn’t always come out as expected. 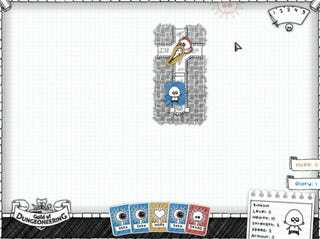 Guild of Dungeoneering is an example on how to do it right. The game in my opinion could be defined as a roguelike dungeon crawler with card battles. That sounds like a lot to take in, but the real twist is that you do not control the characters called Dungeonners in this game, nope, they have their own free will. You are the Guild master and your task is to build the dungeons in which the heroes will traverse to fulfill objectives in order to build your guild and bring fame and glory to it. All of this with a great card based system for every action that can take place. From dungeon building to fighting enemies and off course equipping items, all is done by drawing cards. This sounds a bit complicated so I conducted this interview with Colm Larking, founder of Gambrinous so that he can explain more about his fabulous game. I hope you enjoy it since the game is coming out July 14, 2015. First of all, who is Gambrinous and how was it formed? Gambrinous started out as my one-man-band game company when I started trying to make games in 2008. I started a couple of projects that were too ambitious and eventually gave up on. Finally in 2013 I started participating in One Game A Month, a monthly gamejam, and actually finished some small games. This gave me the self belief to try something bigger again. There’s now five of us making Guild of Dungeoneering. How did the concept of G​uild of Dungeoneering c​ome to be? One of my first 1GAM prototypes was a sort of tile laying dungeon roguelike. You placed randomised rooms in front of an adventurer to build out a dungeon they explored. That’s the concept I decided to expand on that eventually became Guild of Dungeoneering. Very early in development it gained a lot of card game mechanics like card decks for the dungeon tiles, monsters, and loot. I love the intrinsic properties of cards for game design. For example gaining lots of cards fills out your deck making any one particular card harder to draw. I’ve read that the classes in the game will have traits. Could you explain in depth how will this traits work, and how they will affect gameplay? We have different classes of Dungeoneer you can hire, each with their own starting deck of cards you use in battle. As you mention some of them also have traits which are a permanent bonus of some sort. So for example the Cat Burglar is an early class with a special trait ‘Covetous’ which gives them an extra loot card every time you find loot. Normally you get a choice of three but the Cat Burglar gets a fourth draw. You still only keep one but that means you are much more likely to be able to specialize your deck in a way you want during a particular quest run (equippable loot give you more cards for your battle deck). The Barbarian’s special trait is ‘Deathwish’ which gives them a bonus whenever they fight monsters of a higher level than them. This is usually very difficult and with other classes can mean a trip to the guild’s graveyard. It also affects the Barbarian’s AI who seeks out harder opponents instead of avoiding them like everyone else. You can use this trait to your advantage in certain quests. It’s fun because it upsets the natural order of the game slightly. Finally we have traits that have a direct effect in battle, such as the Alchemist’s Blessed trait which gives +1 to all healing. You can even combo this with equipment that gives you more healing cards, which is exactly the kind of layering I love in our various game systems. 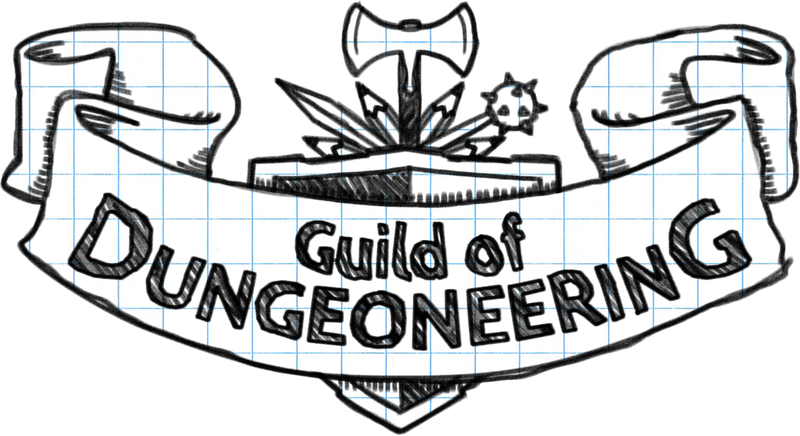 How has tabletop games inspired G​uild of Dungeoneering? Board game and card game influences are everywhere in Guild of Dungeoneering. From the tokens representing monsters and your hero, to the fact that almost everything you do involves drawing and playing cards. One big thing we brought over from those games is the transparency of all our systems. In most board games all the rules need to be clear and everyone knows WHY a certain thing happened (like, say, you rolled a 1), but often in computer games these things are hidden below the surface and you only see their results. We try and explain everything to the player up front. You really see this in the battle system where monsters play their card first and it’s up to you to decide how to respond to it. I read the game has an ending and that it will take 15­-20 hours to complete the main campaign. Right now you are working on dungeons that players will be able to replay. Could you tell us how this will work? That sounds about right for the campaign. It has a set number of quests and then you win it, though you wouldn’t be able to unlock every possible toy in your guild in a single playthrough. We’re also thinking of adding some extra modes to the game post-launch. For example, separate to the campaign, we could have an ‘endless dungeon’ where you are given a single dungeon with some sort of random setup to slog through with it getting harder and harder to survive. Then you can share a high score at the end. I also love the idea of a ‘daily challenge’ as seen in Spelunky. Everyone in the world gets the same seed each day (so in the example above, everyone would have the same start in that day’s endless dungeon) and they only get ONE chance with their score recorded at the end. Super fun. So do I! I’d like to mimic what the board game companies do with expansions. So on the one hand you have content packs like Pirate’s Cove, which add a few new classes, more loot, more monsters and some extra quests. They expand the game horizontally with a bit more stuff in every area of the game. Then we would also do bigger expansions that would expand the game vertically: for example one that added a whole new campaign of similar length to what’s in the base game. One of the things that stands out the most in the game is the art style. How did you decided to go for sketches as the graphics for the game? When I decided to make Guild of Dungeoneering into a ‘proper’ game in October 2013 I knew it would need original art. At the time I was prototyping with some free sprites and background tiles. I started looking around for an artist to partner with, but I also had a thought. What if I just got some actual graph paper and doodled tiles and monsters myself on the graph paper and then scanned them in. It would be a kind of awful-on-purpose look and could have an incredibly homemade feel to it. When I teamed up with Fred a few weeks later I told him about this and he came back the next day with the look that’s now in the game. It’s so much better than what I could have made! I absolutely love it, and I feel it really helps the game stand out. I think more game devs should experiment with their aesthetic. The battle system is gorgeous, I’m personally in love with it. It has a lot of depth and no room for mistakes. Could you explain the process of how it came to be? Yes it’s wonderful now, and layers beautifully with our other systems. It wasn’t always good though! As recently as the end of 2014 battles were completely automated. Your hero had stats, monsters had stats, and they just bashed each other until someone won. I decided you the player needed to actually do more in the game and thought battles were a good place to take over. Cards representing ‘moves’ in battle were an obvious choice and I quickly decided equipment could grant you new cards. However my first draft of the battle system was actually pretty terrible. This was in early January 2015 and it’s what we brought to our first big convention experience at PAX South. You started every battle with the choice of attacking, dodging, or focusing. The monster chose their attack at the same time and then you both revealed. It had a kind of rock/paper/scissors element to it. Choosing correctly let you draw your actual battle cards (special moves you got from your equipment). Just then I hired Oli to help with game design and redesigning this battle system was his first job. He prototyped it with actual physical cards and the system he came up with is pretty much what you see in the game now. It’s all about managing your deck, knowing what’s coming in the monster’s deck, and as you’ve seen there is often no room for mistakes. I think it helps define the game! You have made a complex formula for your game and I’m happy to say that it works out incredibly good. The mix of building the dungeon, card battles and not caring about you dungeoneers is brilliant. What advice would you give to aspiring game developers out there? It works now, but everything in the game has gone through a lot of revisions and times where things didn’t really come together that well. My advice would be to try and settle on your vision for the game early on but not to get tied to specific mechanics. You need to playtest mechanics to see what works, what’s actually fun, and use your vision to help guide your choices. So for example the vision was always there that you were managing a guild, and you weren’t that tied to any one hero, and that in fact maybe they were bumbling idiots. Certain mechanics married well with this vision (for example it’s quite easy to end up in a fight against a monster you almost certainly can’t beat) and that’s a sign of things layering well. Playtesting is incredibly important. I brought Guild of Dungeoneering to monthly gamedev meetups here in Dublin throughout development and would watch people play while I took notes. You learn an awful lot about what’s working and what isn’t this way. Don’t be afraid to share rough, early versions of your game to see what’s working and what isn’t.